A new addition to the multiple New York Times best-selling Ring of Fire series. After carving a place for themselves in war-torn 17th century Europe, citizens of the modern town of Grantville, West Virginia take on a murderous conspiracy of operatic proportions in Magdeburg, the capital of the United States of Europe. It is the year 1636. The United States of Europe, the new nation formed by an alliance between the Swedish king Gustavus Adolphus and the West Virginians hurled back in time by a cosmic accident, is on the verge of civil war. His brain injured in the war with Poland, the USE's emperor Gustavus Adolphus is no longer in command. Enter Swedish chancellor Oxenstierna, a leader of aristocratic reaction against democracy. His goal: to assemble the forces of the hidebound ruling class in Berlin and drown the revolution in a bloodbath. In Magdeburg, the capital of the USE, Mike Stearns' wife Rebecca Abrabanel is organizing popular resistance to Oxenstierna's plot. As part of the resistance, the American musician Marla Linder and her company of down-time musical partners are staging an opera that will celebrate the struggle against oppression. Princess Kristina, the heir to the USE's throne, is now residing in Magdeburg and is giving them her support and encouragement. But another plot is underway--this one right in the heart of the capital itself, and with murder as its method. The only people standing in the way are a crippled boy and the boxing champion who befriended him, and an unlikely pair of policemen. Can the American detective Byron Chieske and his down-timer partner Gotthilf Hoch thwart the killers before they succeed in their goal? Eric Flint is a modern master of alternate history fiction, with over three million books in print. He’s the author/creator of the New York Times best-selling Ring of Fire series. With David Drake he has written six popular novels in the “Belisarius” alternate Roman history series, and with David Weber collaborated on 1633 and 1634: The Baltic War and latest Honorverse series entry, Cauldron of Ghosts. Flint was for many years a labor union activist. He lives near Chicago, Illinois. David Carrico's writing career literally began with a cliche. He finished reading a particularly bad novel, threw it across the room, and declared, "I can write better than that." It took a while, but eventually he began selling stories, many of them laid in the 1632 universe and published in Grantville Gazette. 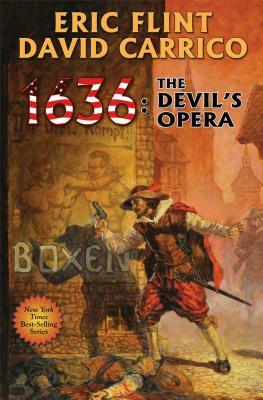 1636: The Devil's Opera is his first novel. David lives in Oklahoma City, Oklahoma.